If you are a fan of big spinning wheels (thinking Wheel of Fortune here), then the U Spin games are likely to appeal to you. Unlike previous slot machine 'wheel' games, with this one you don't just press a button to get the wheel spinning, you actually spin it. Battling with tough competition, Bally Technologies developed several slot machines games for the online market featuring a special U-Spin round. 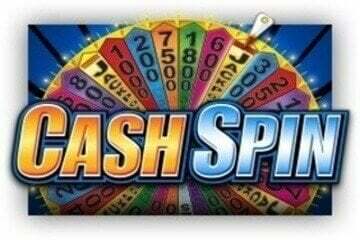 The most famous of them is Cash Spin, which has 5 reels and 243 ways to win. The graphics are basic, although vibrant and enhanced with bright colours. The symbols include playing card denominations from 9 to Ace and images of diamonds, dollar signs, emeralds and rubies. Clearly, the intention is to focus on items that scream wealth and riches. There are three special symbols, a Wild, a Money Bag Bonus symbol and a U-Spin symbol. The highlight of Cash Spins is the U-Spin Wheel of Fortune feature, the one that is shared among all Bally’s U-Spin online slots. By landing the U-Spin symbol on reels 1, 3 and 5 in one spin the feature gets triggered and the player gets the chance to spin the big wheel loaded with prizes. The wheel is spun by clicking and dragging or touching the screen if played on mobile and the players waits to see where it lands. Potential prizes include 12 to 60 free spins with 2x multipliers and prizes expressed in casino credits. The other fun feature is the Money Bag bonus - triggered with three bonus symbols, the Money Bag awards the players with a cash prize worth 3x to 50x the total stake. Cash Spin’s offers an RTP of 94.15%, and a non-progressive jackpot of 50x your total bet in the Money Bag feature. The U-spin series of slots by Bally also includes games like Michael Jackson, Vegas Hits and Golden Pharaoh. When I last played this game in Vegas, it was great to see people standing up and spinning the wheel of fortune, then cheering as the big wheel goes around. Just like on the show. Of course, the wheel in the U-spin slots is not a mechanical one, but instead it is embedded into a huge video screen. It's pretty clever though as you use your hand to spin it. for those that prefer, there is an option of pressing a button, but most people do like to spin it with their hands. The U Spin slot machine itself is a pretty basic 3-reel slot, as with the most popular of the wheel of fortune games out there, but it does have several new and innovative features that will appeal to many.